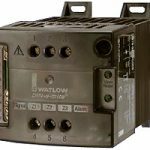 We have Watlow and Crydom Solid State Relay switching relays (SSR) for a more precise temperature and power control in applications where you need tighter control and smooth switching. 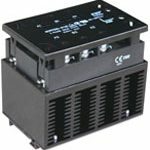 We carry all styles of power controllers to fit your process needs. With solid state switching, your heater life is increased and temperature control is optimized. Due to the nicer switching of SSR’s, users can increase watt densities of their heaters and safely control them without the over-shooting of the mechanical switching. SSR’s allow users to switch power with AC or DC input control. 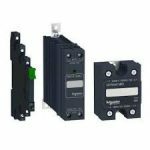 Our sales engineers can help you select the correct solid state relay product for your process. Call 844-787-4328 to work with one of our engineers… We can help you select the proper solid state power controller. Zero firing is a method of proportional voltage control in which the SCRs are fired only when the voltage wave form crosses the zero voltage level at half cycles. Zero fired power controls are useful when radio frequency interference (RFI) and line voltage distortions characteristic of phase angle power controls must be avoided. Phase angle fired controls vary the voltage to the load by controlling the point of conduction within each ½ sine wave, by applying a timed trigger pulse to the SCRs-hence the name phase angle controlled. Therefore this method provides infinitely variable AC voltage control. The result is that only a part of each cycle is “ON” and the remaining part of the cycle is “OFF” providing proportional RMS voltage control. This method provides a finer resolution of AC power control, but can generate RFI and line voltage distortions. Custom doesn’t necessarily mean “long delivery”. Phoenix Thermal Supply can offer you a wide variety of Quick-Ship products, totally made-to-order, or assembled from stock component parts. Made the way you want it, when you need it. Limitations apply, so please inquire as to options. With available options you can make an educated decision based on your need for delivery, performance and/or product fit and cost. Phoenix Thermal Supply offers an extensive array of products that can be shipped same day, or within 24 hours of order placement. Many of our Quick-Ship products are in stock, and are just waiting to be “finished” with final modifications. We’ll give you all the details you need to help you make the ordering process simple and effortless. We pride ourselves on not being “order takers." Rest assured, if you have a machine down, we will jump through hoops for you. ©2018 ALL RIGHT RESERVED. Phoenix Thermal Supply, Inc.